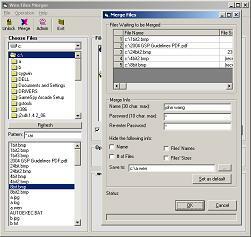 Amazon This program, written in Visual Basic, has similar functionality to the well-known GoToMyPC service provided by Citrix Online: user can remotely control his or her computer. The user opens a server on the target machine, and he or she moves to another machine and opens a client. Given sufficient access the client can control the target computer via mouse and the keyboard. The user has many options, including image quality, frame rate, protocol type, screen updating scheme, etc. The way I implemented this program is the server keeps sending screen shots of the desktop to the client as images and the client displays those images as they come in. When user moves and clicks on the mouse and types on the keyboard the corresponding event is generated and sent over to the server. 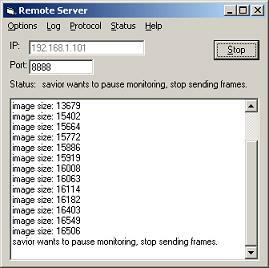 Once the server receives it it applies that event to the host computer. That's it! I found that the major bottleneck is I used 24-bit bmp format to save images and the image size is very large. I fixed it by using jpeg format instead and it saves TONS of space. So any lesson you learned from all this? When dealing with a problem, try to think in a broader, realistic perspective. This website is for Jeantour, a travel agency in Taipei, Taiwan. This program detects where eyes are in a photo. This is a file merger program written in VB. This is a random maze generating program written in C.